So, you finally got the Jelly Bean update on your Samsung Galaxy S III, but one little problem—you've got some red glow around the edges of your screen now. Is your phone messed up? No, it's just a tiny glitch that some users have been reporting after updating their Galaxy S3s to Android 4.1.1, and there are a few quick ways to get rid of it. 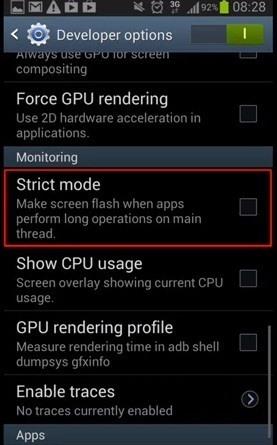 Go to Developer Settings in the Settings menu on your phone, then turn off Strick Mode. This mode makes the screen flash when certain applications are using a lot of system power. Then turn of Strict Mode. This mode makes the screen flash when certain applications are using a lot of system. Simply hold down the power button for 10-20 seconds to soft reset it. 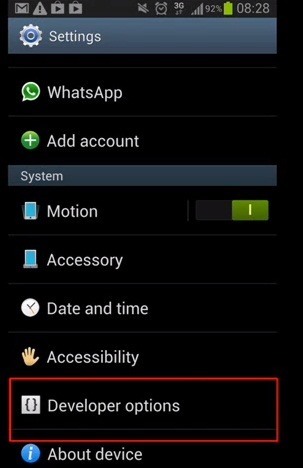 Press and hold the Volume Up + Home + Power button simultaneously to hard reset it. Then, when in recovery mode, select Factory reset. You can also go to Settings -> Back up and reset -> Factory data reset -> Reset device -> Reset everything. Be sure to BACKUP your device before doing this, since it will wipe you phone clean. This is a last resort method. All three of these methods have been known to resolve the problem, but the first method is the easiest and should be your primary option. I tried Method#1 and it worked. It's amazing! You must shut down the phone after doing that to fix that lag. I tried almost everything you suggested but I can't seem to get rid of that flashing red boarder light on my Samsung galaxy 2? Any suggestion please? Cause that light is driving me crazy!! I tried #1 and #2 and they didn't work. Now I have to do a factory install because the company couldn't put out a successful update? Compoletely irresponsble! #1 and # 2 do not work on my A3. Avoiding # 3. I tried method #1 and #2...didnt work. Thinking of probably trying method#3; but please what likely concequences would the glowing red border light have on the Note 3 if not solved? Method one worked! Thanks, that red border was driving me crazy. Have to restart after doing it.